The Assynt landscape is particularly attractive when lit by low sunshine in the winter, especially with snow on the hills. It is the lichens, however, that provide accents of a surprising range of colour and form, when you look a bit closer. Examples are these three species, photographed by Gwen Richards on 4th March along the Drumbeg peat track. A south-facing gneiss outcrop, overlooking Loch Bad na Labhairt (NC119304), bore clusters of small purplish-brown thalli of one of several species of rock tripe found locally, Umbilicaria polyrrhiza. The generic name relates to the single central holdfast of each thallus, and the specific name to a felt of black root-like structures which cover the underside and stick out around the edges. 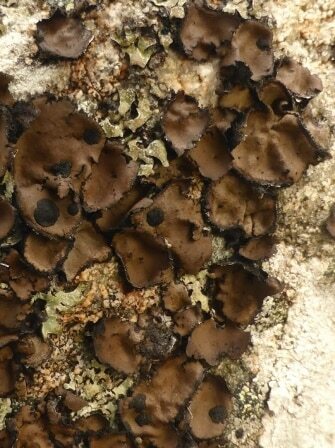 The black fruiting bodies or apothecia shown in this photograph are very rare. This species is restricted to upland areas of the British Isles, on hard siliceous rocks with some degree of mineral enrichment. 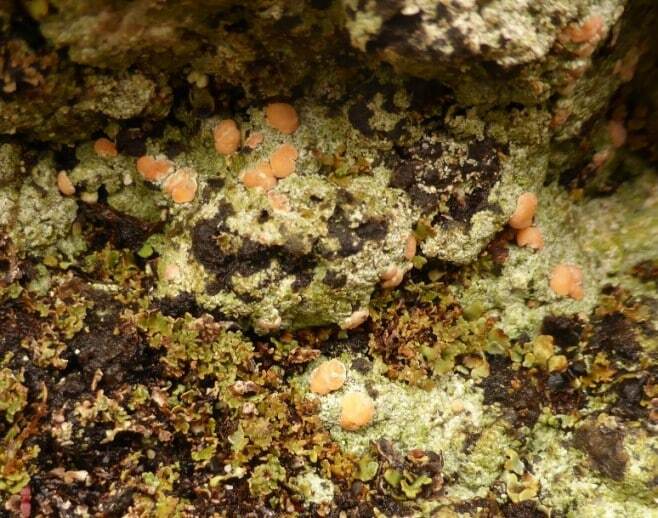 Not far away, under a peaty overhang, was the light green crust of Icmadophila ericetorum, studded with flesh-pink apothecia. 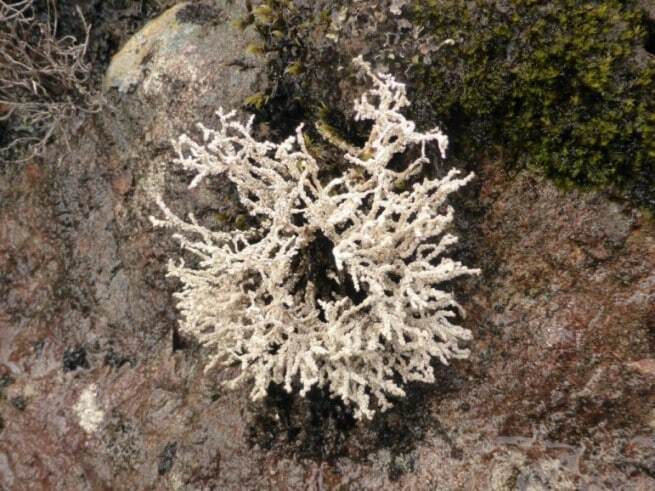 It is one of the first lichens to colonise damp peat and is found throughout Highland Scotland, but only rarely elsewhere in the British Isles. A little nearer Drumbeg (NC122312) was an example of a group of small, shrubby lichens which look like tiny corals, Stereocaulon vesuvianum. In places beside the track, ice-smoothed outcrops of the gneiss are covered with this beautiful lichen. It is common only in the upland areas of the British Isles, on well-lit, mineral-rich, siliceous rocks. These are just three examples of well over 500 species of lichens, extraordinarily varied in appearance, that occur across Assynt, from below high-tide level to the tops of the hills.